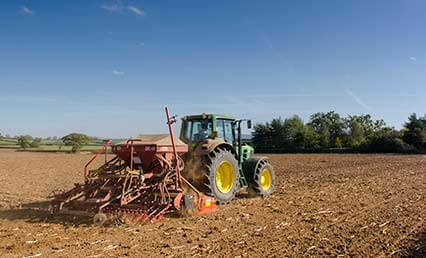 From heavy duty subsoilers to mechanical seed drills, TENMAT efficiently solves the wear protection challenges of the agricultural sector with FEROBIDE; an all-purpose tungsten carbide composite wear protection material which distinguishes itself through its high resistance to impact and installation through welding. The superior material gives soil-engaging-points which work longer and harder than before. TENMAT offers significant benefit to the farmer by greatly reducing farm downtime and stock holding, whilst increasing point lifetime. 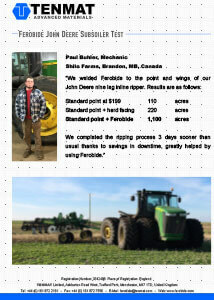 Working efficiency and farm outputs are directly improved through the use of durable FEROBIDE wear protection tiles. The low profile tiles significantly reduce drag through soil and maintain the design profiles and working depth of soil-engaging-points. By maintaining its shape and being itself a long-life material able to withstand heavy abrasion and impact, FEROBIDE offers long-lasting protection to soil-engaging-points. 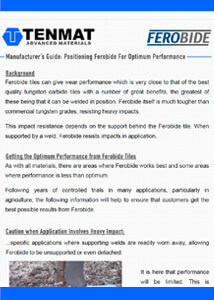 Furthermore, FEROBIDE is applied within minutes through welding. Firstly, this allows for the farmer to determine exactly where soil-engaging-points receive wear protection. The simple welding installation reduces downtime as it requires very little weld preparation outside of chamfering to hide weld support behind the FEROBIDE tile. FEROBIDE puts total control over wear protection in the hand of the customer. 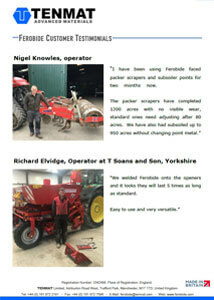 FEROBIDE is welded directly onto Agricultural Machinery Points and can be itself cut to shape, fitting any point geometry. 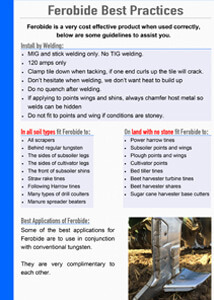 Welding of FEROBIDE is carried out with standard workshop equipment, meaning there is no time lost. This is in contrast to the difficult attachment methods inherent to the specialist brazing techniques of traditional tungsten carbide. I consent to Tenmat processing my personal data in relation to this enquiry.